Definition: An Odontogenic cyst that surrounds the crown of impacted tooth, caused by fluid accumulation between the reduced enamel epithelium and the enamel surface, resulting in a cyst in which the crown is located within the lumen. This is the most common developmental Odontogenic cyst. Develops by accumulation of fluid between the reduced enamel epithelium and the tooth crown after crown formation. 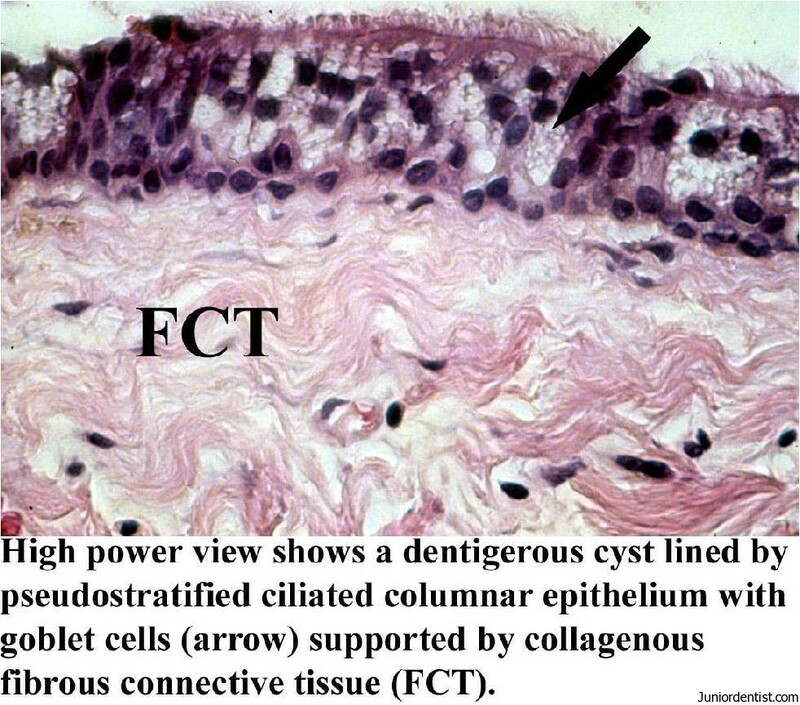 By transformation of epithelium in the wall of the dental follicle and uniting with the follicular epithelium. 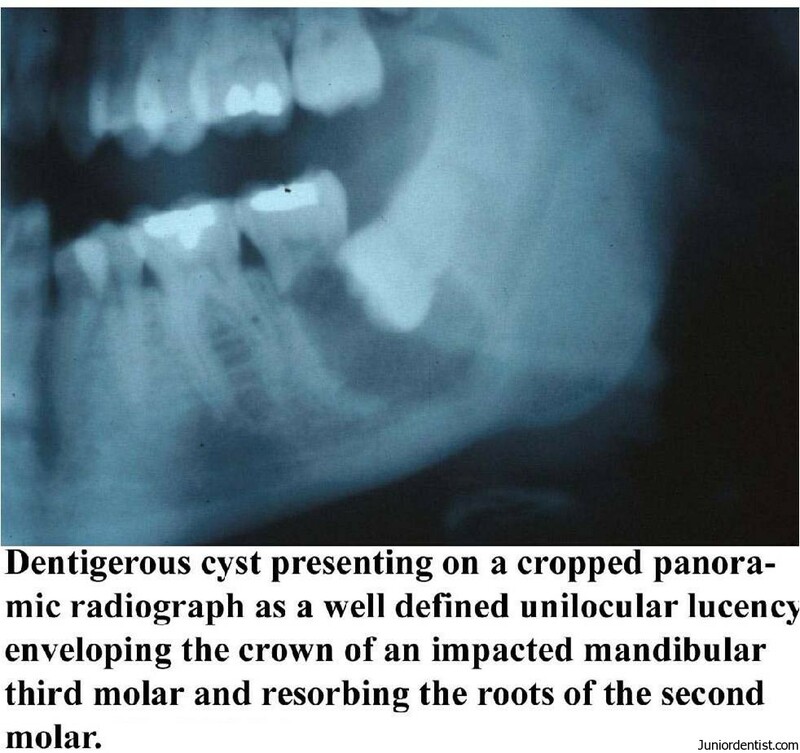 Dentigerous cyst always is associated with the crown of a normal permanent tooth. Deciduous teeth are rarely involved. Dentigerous cyst may also be found enclosing a complex compound odontoma or imvolving a supernumerary tooth. These are Solitary, Bilateral and Multiple cysts found usually in association with a number of syndromes like cleidocranial dysplasia and Maroteaux-Lamy Syndrome. Dentigerous cyst is likely to cause Mural Ameloblastoma, which is a type of ameloblastoma. Localized areas of “Bud like” proliferations of cystic epithelial cells may be seen in few area, which are known as “Mural proliferations” and they indicate the development of “Ameloblastomas” which also proove the development of ameloblastoma from lining of dentigerous cyst. This complication will lead to difficulty in treatment of Dentigerous cyst. Displacement of Third molar which sometimes gets compressed against the inferior border of the mandible. Age: Seen mostly in the second and third decades of life. Radiolucent area is associated with un-erupted tooth crown. Circumferential Type: The follicle expands in a manner which appears to envelope the Entire tooth. Sometimes the radiolucent area is surrounded by a thin sclerotic line representing bony reaction. 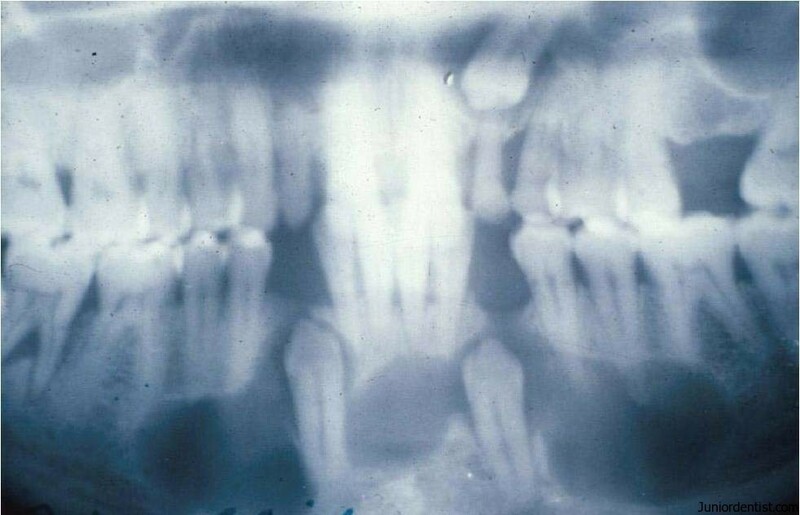 Presence of odontogenic epithelium in islands in the connective tissue wall – which may give rise to the development of AMELOBLASTOMA. RUSHTON’S BODIES – peculiar, linear, often curved, hyaline bodies with variable staining of uncertain origin and unknown significance, but probably of hematogenous origin, found within the lining epithelium – especially in areas of inflammation. The cystic lumen contains thin watery yellow fluid, occasionally blood stained. Mandibular ones may show mucous secreting cells, sebaceous cells and lymphoid follicles sometimes. Development of AMELOBLASTOMAS in the lining epithelium and in the islands of odontogenic epithelium. Development of MUCO EPIDERMOID CARCINOMA especially in the mandibular ones. EPIDERMOID CARCINOMA – due to keratin metaplasia in the epithelial component. Larger lesions: With Bone loss and the cyst thinning the bone drastically- Marsupilisation and Surgical drainage is done. Recurrence is rare unless there is neoplastic transformation. could you please send the APA citation of this article?